Opposition parties have accused the BJP-led Centre of attempting to derail the excavations since Hindutva groups are uncomfortable with its findings. In 2015, the Archaeological Survey of India began the first phase of its excavations in a nondescript village 12 km from Madurai in southern Tamil Nadu. Over the next two years, at Keezhadi, archaeologists unearthed a history-defining Sangam era site – the first concrete proof of the existence of urban settlements in that epoch in Tamil Nadu. The Sangam era, from 400 BCE to 200 CE, refers to a period of ancient Tamil Nadu in which Tamil culture and language evolved to its zenith, producing some of the finest literature and art in the language. This period was named after the Sangams (academies) of Tamil poets and writers said to have existed in and around Madurai. In Sangam times, Tamil Nadu consisted of parts of Kerala, Andhra Pradesh, Karnataka and Sri Lanka as well. Carbon dating of the artefacts recovered from the Keezhadi site have placed it at 200 BCE. The artefacts excavated include pottery pieces with inscriptions in Tamil Brahmi script, copper beads and a variety of metal tools. 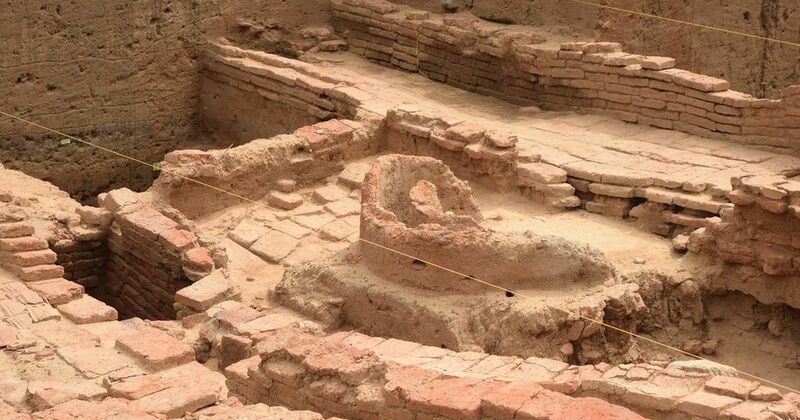 The settlement has been found to have complex drainage systems such as the ones found in the Indus Valley Civilisation, and brick structures, showing that it was once a flourishing settlement. The excavations started with four trenches in 2015 and expanded to 102 in two years. The project is now spread across 110 acres. The team excavating the site was led by superintending archaeologist Amarnath Ramakrishna, who has overseen two phases of the project. However, in a sudden development last week that left many surprised, Ramakrishna, who belongs to the institution’s Bengaluru office, was transferred to Guwahati in Assam. This came a few months after the excavations at Keezhadi were halted due to the lack of funds. At that time, the Bharatiya Janata Party-led government at the Centre defended the halt in the work at Keezhadi by claiming that it was preparing a status report on the excavations. But after a storm erupted over the suspension of work on the project, it gave the nod for the third phase of digging. Opposition parties have accused the BJP-led Central government of attempting to derail the excavations at Keezhadi since Hindutva groups are uncomfortable with its findings. They said that the excavations have added strength to the idea that an advanced and secular Tamil civilisation – independent of the Hindu tradition – may have existed in the South during the Sangam era. This claim has been central to the cultural assertion of Dravidian politics, which has used Sangam literature to distinguish Tamil Nadu from the rest of the country. In response to a questionnaire from Scroll.in, the Archaeological Survey of India said that Ramakrishna’s transfer was made according to norms. “Transfer of ASI officers at the level of superintending archaeologist is governed by the existing transfer policy and the transfers are affected as per the transfer policy,” stated Rakesh Singh Lal, additional director general of the Archaeological Survey of India. According to the rules, a superintending archaeologist is transferred every two years. Ramakrishna started work in Keezhadi in 2015. The official added that 26 officers have been transferred along with Ramakrishna. When asked if an abrupt transfer in the middle of a crucial excavation could affect the project, the official added that “transfer of officers does not affect activities of ASI. New officer who takes over will take care of work of his predecessor and the work will continue”. But political parties in Tamil Nadu are not convinced. They have pointed out that of the 27 transfers, only Ramakrishna was attending to a major excavation. Currently, the Archaeological Survey of India is excavating four major sites – Keezhadi, Binjor (Rajasthan), Vadnagar (Gujarat) and Urain (Bihar). The officers in charge of the other three sites have not been disturbed. G Ramakrishnan, Tamil Nadu Secretary of the Communist Party of India (Marxist), said that the Centre tried to derail the project by stopping funding in October. However, the Union government was forced to restart the excavation after the Opposition took up the issue in Parliament, he added. He added that those who try to paint a homogeneous picture of India’s ancient past were uncomfortable with the new findings, which suggest that a secular civilisation flourished in South India in the ancient times. The criticism was also echoed by Kanimozhi, Rajya Sabha member of the Dravida Munnetra Kazhagam. She said that evidence of an independent Tamil civilisation was getting systematically subverted. This reporter has learnt that Amarnath Ramakrishna has challenged the transfer order before the Central Administrative Tribunal, which on Thursday told the Archaeological Survey of India to consider his petition to reconsider the transfer. A senior ASI official said Ramakrishna wanted to continue his work in Keezhadi since the third face of excavations, which begin next month, were possibly the most crucial given the depths it would reach.